The bloom is off. Aside from FB’s business results, such as their abysmal financials and their ads’ anemic, low-end response rates, there are some basic usability issues I have found. Neither I, nor my post-teen children, nor the new teeners, can figure out why these issues persist and, frankly, we can do without them. Maybe some of these things can be fixed within the platform, but many of the issues are user/behavior based. 1. Zero Privacy – Bill Joy said it over 20 years ago: you have zero privacy, get over it. What happens in Vegas stays on YouTube. If you don’t want people to know something, don’t say it, don’t video it, don’t post it, don’t comment. 2. Snooping Parents – at any age, there are just certain things you don’t even tell the fam. 3. Peer Pressure – How many times lately have you clicked the Like button based on guilt, pity, sarcasm, or some promise of reward? What, then, is the value of a “like”, once we’ve polluted the Likestream with insincerity? 4. Tasteless junk – sometimes I just don’t want to know about others’ nasty habits. And not everyone has the same sense of humor. Xenophobia runs rampant. Look it up. 5. 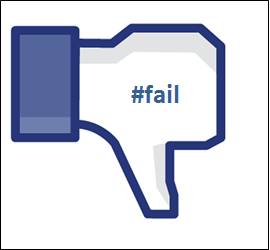 Career suicide – Hiring and prescreening include Facebook reviews. ‘Nuf said. 6. Filter failure – This is arguably an umbrella issue in that it touches upon some of the other #fails listed here. And, yet, it is separate: You can’t selectively filter your friends’ feeds. Not everything in your friend feeds is relevant or even interesting, and it can’t be filtered to show only what’s interesting to you. 7. Plummeting cool factor – All of the above factors feed a sense of disillusionment. Or is it just me? 8. Alternatives – Tumbler, Instagram and Twitter are just as capable of perfoming the essentials. Tomorrow: who knows? I’ve only listed 8. I’m sure there are a couple more. Chime in! This entry was posted on Tuesday, June 5th, 2012 at 9:35 AM and is filed under Opinion, social media, User Experience. You can follow any responses to this entry through the RSS 2.0 feed. You can leave a response, or trackback from your own site.